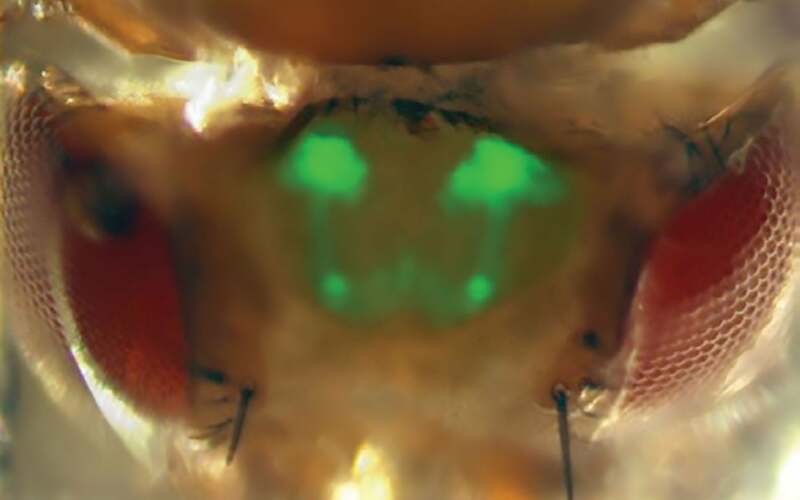 Position of mushroom body (green) in fly’s head, in a composite image. Cold Spring Harbor, NY — We know from experience that particular smells are almost inseparable in our minds with memories, some vague and others very specific. The smell of just-baked bread may trigger an involuntary mental journey, even if for a moment, to childhood, or to a particular day during childhood. Or it may, more diffusely, remind someone of grandma. How are these associations forged in the brain and how do we remember them? A research team at Cold Spring Harbor Laboratory (CSHL) led by Assistant Professor Glenn Turner has published results of experiments that show large populations of neurons in the brains of living fruit flies responding to a variety of odors. The results demonstrate that a portion of the fly brain known to be important in learning and memory responds in a characteristic fashion that helps explain how an association is made between an odor and an experience—the basis of a memory. Turner and his CSHL colleagues were able to simultaneously monitor the activity of over 100 individual neurons in a portion of the fly brain called the mushroom body (MB). They did this by engineering a line of flies whose MB neurons expressed a gene that made the neurons emit a fluorescent calcium signal while firing. They could then record and closely scrutinize the patterns. Previous research suggested that neuronal firing in the MB was “sparse.” This follows from a general rule about how animals are thought to represent and remember odors. They have an abundance of receptors that detect odors, and these are “broadly tuned,” meaning they are designed to take in and process as many odors as possible, even those that are in chemical terms very similar. There’s plenty of overlap in their sensitivity. In the research Turner’s team published Aug. 17 in the Journal of Neuroscience, they used the calcium-signaling method to clearly demonstrate what the theory proposes. They found that fly mushroom body neurons represent odors in consistently sparse fashion (see illustration), and also that the responding neurons were distributed randomly within the MB, and showed no sign of spatial organization. The team found that fewer than 20% of the MB neurons will glow with a calcium signal when a specific odor is presented to the fly. Surprisingly, this does not vary with the intensity of the odor, or in proportion to whether the odor is that of a very simple or complex molecule; or, indeed, whether the odorant is naturally occurring or artificial. The fact that there is a consistent pattern of firing explains the utility of sparseness to an individual fly: whatever that individual’s pattern of MB neuronal firing in response to the odor of orange, that pattern will repeat and therefore is something that can be remembered. A remembered pattern—a memory—is a basis for action, such as homing in on the source, or moving away from it, if the association is a negative one. “The fact that the patterns of cells activated by different smells are randomly scattered throughout this brain area means that it’s very rare that two patterns will look alike,” Turner says, and this could be important for ensuring that memories of different smells are unique. ”The lack of specialization in this important part of the fly brain surprised us,” Turner says. “for instance, we showed that natural and artificial odors are not distinguishable from the fly’s point of view. And this leads us to propose that the mushroom body is a purely associative brain center. Read “Making Sense of Smell,” (pdf) about the how the Turner lab and other labs at CSHL are studying olfaction to learn more about how the brain works. This work was supported by a grant from the National Institutes of Health (NIH), the Crick-Clay Fellowship from the Watson School of Biological Sciences at Cold Spring Harbor Laboratory and a predoctoral training grant from the National Institute of General Medical Sciences, NIH. 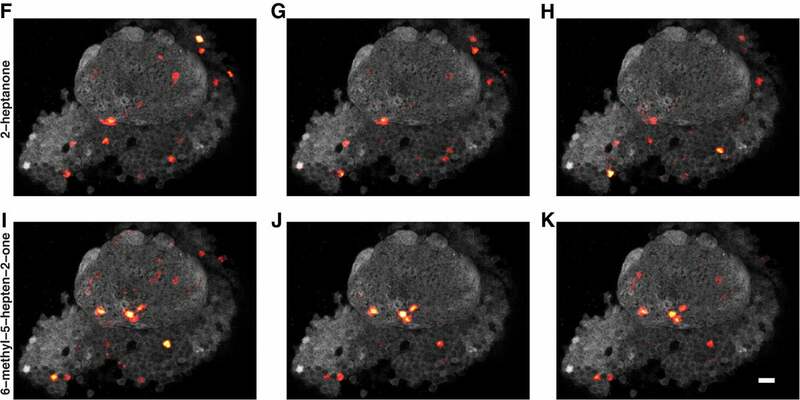 “Cellular-Resolution Population Imaging Reveals Robust Sparse Coding in the Drosophila Mushroom Body” appears in The Journal of Neuroscience August 17, 2011. The authors are: Kyle S. Honegger, Robert A.A. Campbell and Glenn C. Turner. the paper can be viewed online at: doi: 10.1523/​JNEUROSCI.1099-11.2011.